Some people roll their eyes (or grunt or sigh) when they're reminded of how many studios Ubisoft uses to make their massive Assassin's Creed games, but as someone who likes each year's installment, I just find it interesting. Ubisoft Montreal normally leads development, though they clearly juggle teams, giving each major AC Montreal team at least two years to make a game. 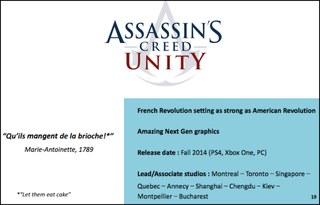 The company traditionally dedicates at least one studio (Annecy, previously) to multiplayer and at least one studio to DLC (Quebec, in the past). I know that several years ago the Singapore team was credited with making the "hidden location" levels of the games, which were cool, linear and more blockbuster-movie action sequences. Singapore was then credited with doing a lot of the development of sailing for, I believe, ACIII and ACIV. The Assassin's Creed games are modular as is, so this continued multi-studio approach doesn't worry me. I've found, in fact, that it results in a lot of surprising high-quality content tucked off the game's main path. I just hope that Ubisoft has improved its ability to tie all of its studios' contributions into a coherent, well-rounded game. That's a job for the creative director and the producers, I guess.